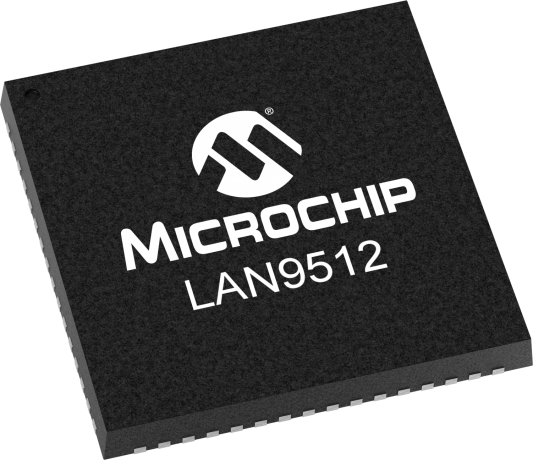 Microchip's LAN9512/LAN9512i are the industry's first fully-integrated, Hi-Speed USB 2.0 hub and high-performance 10/100 Ethernet controllers. LAN9512/LAN9512i are specifically designed to provide system architects with a low-cost, power-efficient, small-footprint USB to Ethernet and multi-port USB connectivity solution in a single package. The LAN9512/LAN9512i contain a Hi-Speed USB 2.0 hub with two fully-integrated downstream USB 2.0 PHYs, an integrated upstream USB 2.0 PHY, a 10/100 Ethernet MAC/PHY controller, and an EEPROM controller. This offers Microchip's highest level of USB 2.0 and 10/100 Ethernet compliance and interoperability. Additionally, LAN9512/LAN9512i devices simplify system design by leveraging the existing USB stack and reducing the PCB footprint by up to 65% compared to discrete competitive solutions. USB-based networking technology offers a cost-effective and smart design alternative to traditional PCI/PCI-Express networking solutions due to the flexibility of routing and placement of Ethernet and USB connectivity ports. Microchip's complimentary and confidential LANCheck® and USBCheck™ online design review services are available for customers who have selected our products for their application design-in*. LAN95xx Driver for Mac OS 10.5.x (Leopard), please use pkg 1.x. Please, select one of the Databooks.